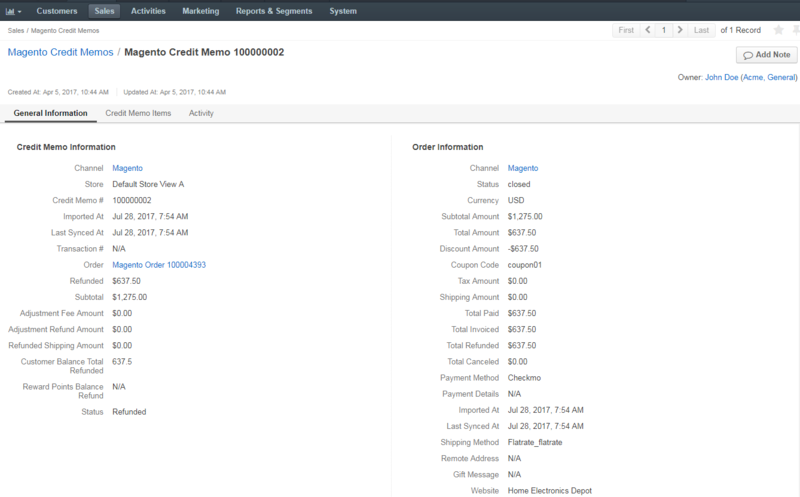 To view all Magento credit memos, navigate to Sales > Magento Credit Memos in the main menu. Clicking on the selected memo from the grid. Hovering over the more actions menu to the right of the memo and clicking . Navigate to Sales > Magento Credit Memos in the main menu. Find the required credit memo and click on it to open. Alternatively, hover over the more actions menu to the right of the necessary organization and click to open its view page. General Information section is for credit memo and order details, such as the store from which the order has been placed, order number, the amount refunded, etc. Credit Memo Items section lists the items which the credit memo covers. Activity section includes any notes related to the credit memos (if available).